The name comes from King Solomon de Mendana, the nephew of a former Peruvian governor! Country Information: The tropical Solomon Islands temperatures are wet and warm year-round. The name comes from King Solomon de Mendana, the nephew of a former Peruvian governor. About 700,000 people live here. The islands gained independence in 1978 from Britain and have a similar government to England’s. The main language is English and the main religion is Christianity. Its primary exports are copra and palm oil, with the island also having lots of minerals such as zinc, iron, nickel, and gold. Timber used to be a primary export but the forests are now overexploited. The time zone is 16 hours ahead of EST. 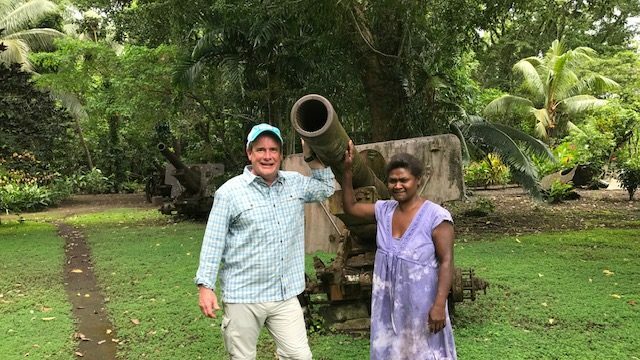 The Solomons are famous for their beaches, diving in the coral atolls, shopping in local markets, and visiting various museums and WWII battlegrounds. Some unusual facts are that despite English being the main language, about 120 different dialects are spoken throughout the islands. Another strange fact is that 5-10% of inhabitants have blond hair from a gene found in Northern Europe, yet the gene occurred spontaneously and was not passed down from Europeans. Traveling here truly was going back in time. What does that mean? When I offered my dive partner a piece of chewing gum, he asked what it was! 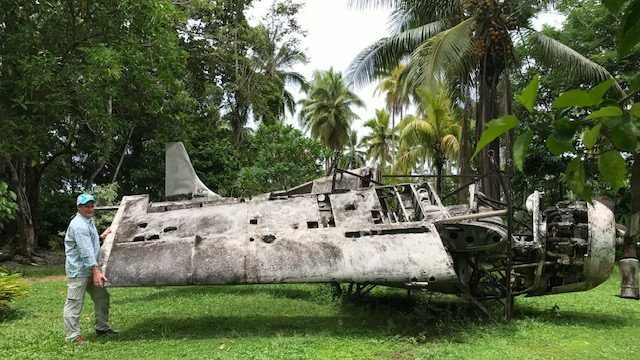 Clearly, this place doesn’t get many tourists, 600 per year, and those who come are there to see the famed Guadalcanal war monuments, which are exceptional. 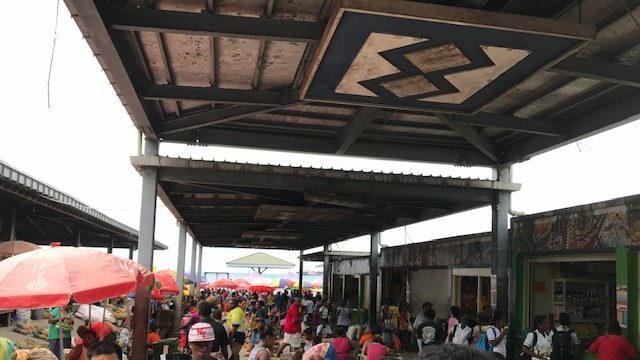 The capital Honiara (pronounced Hone – E – Ara) is a working city, where locals from the 999 islands have come to find employment. The streets are ridden with potholes (there is one major street running east to west through the city) and it is doubtful it has been repaired since the allies departed after World War II. Many of the children walk the streets and go to school barefoot. Many use and adults have a mouth full of beetle nut chew, In addictive tobacco chew inducing a mild high. The locals outside of the capital city spend an inordinate amount of time doing nothing lounging on their porches or hanging out by the local bottle shop. Visiting the outdoor war museum was fantastic and the highlight of my time in this country, although I didn’t appreciate being shaken down for a $150 video fee, which I’m guessing some unsuspecting suckers might pay. I was overcome with emotion while reading the monument in the museum’s garden. Why? Because you could almost hear the sound of the planes flying overhead in the Naval battles been fought just off the coast. The monument was a reminder of how awful and futile war really is, and how we should be resolute in preventing it. Another highlight was diving the wrecks on Bonegi Beach. Props to Tulegi Dive! I loved walking through the outdoor fishmarket, which was one of the best in the world, and mingling with the locals! The Heritage is the finest hotel on the island and is up to discriminating Western standards. It has secure fencing all around the perimeter and guards patrolling. The ocean view rooms were spacious and lovely, and the housekeeping staff were pleasant and helpful. The poolside bar was fantastic and I enjoyed a couple of Sol Brews there.